With the entry of Kia’s first model into India now eagerly awaited, we visit their design and R&D facilities in Germany to gain a deeper insight into the brand. We also sample a couple of Kia vehicles that you may soon see in India. As someone who’s obsessed with all things automotive, it’s but obvious that I would relish the opportunity of exploring development, research and design facilities of manufacturers – both in India and abroad. One of the reasons is my love for watching products being developed and manufactured – it’s an art really, something that’s not appreciated enough but is intensely invigorating to watch and learn from. Also, I enjoy picking the brains of the people behind the products that I obsess over day-after-day. And sometimes it’s deeply satisfying and incredibly fascinating to see how some of the simplest of things are actually the result of years of intense research. Needless to say, our visit to the Kia Design Studio in downtown Germany, and their European R&D Center in Russelsheim, was a satisfying experience. Our tour began with an extensive presentation from their Vice President of Design, Gregory Guillaume. 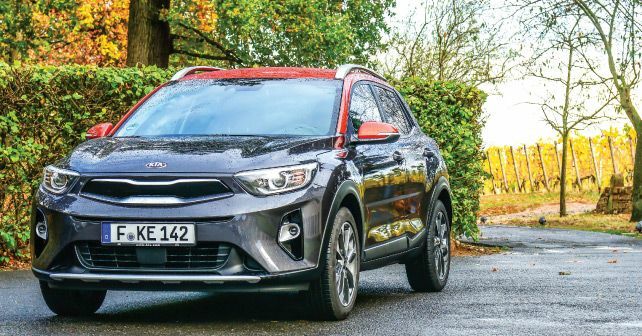 An affable French gentleman who speaks fluent English and German, Gregory explained to us the details responsible for the rather extraordinary acclaim Kia has received for its designs and the ability to take risks in that department. The main focus of his presentation was a car that’s very dear to him – the ground breaking Stinger GT, a car he spearheaded in terms of design. The whole process of developing a brand-new design language for a segment in which the brand has never competed before – a big challenge for the company indeed – was really fascinating to learn. An interesting touch on the Stinger, for instance, is the extension of a horizontal element from the rear light into the rear quarter panel, which, as Gregory explained, is because of side marker lights that American regulations require cars to have. Since they had to install the lights any way, he thought of doing them as an integrated piece rather than just a stick-on afterwards. Quirky, but fascinatingly well integrated. The next day, we spent a lot of time with their Head of Product Planning for Europe – David Labrosse, who incidentally spent a month backpacking across Leh many years ago – at their expansive R&D Centre just outside Frankfurt. Our discussion revolved around the Euro VI regulations – already in effect in Europe, and soon to be introduced in India in April 2020 – and the way they’ll affect the Indian motoring industry. Another interesting aspect of our conversation was about the future of motoring. As David said, we don’t really know if electric cars are the future of motoring, for this technology choice is being largely driven by politicians and activists rather than by the market. So, by the time the year 2030 arrives, the choice of fuel, the future of motoring and the way we look at cars might be something else altogether. For all we know, hydrogen powered cars might be the future. At its European R&D Centre, Kia has all three technologies in place – ICE, Hybrid and EV – and the development of hydrogen vehicles is already in process. So, they’re clearly not putting all their eggs in one basket. Of course, a trip to an automotive manufacturer wouldn’t be complete without sampling something new. So, in Frankfurt, we tried out a variety of Kia machines that are currently on sale in Europe. First up was the Ceed hatchback, which is actually quite a good product. The manual diesel version I drove was a brilliant package, and there wasn’t much to find fault with. The only gripe – and Kia wanted our opinion on whether any of these cars could work in India – is perhaps that, at 4.3-metres in length, it’s probably too big for India. Second was the Soul EV, a quirkily styled hatchback that, in its full EV form, is an interesting product that drives quite well. Sure, the brake regeneration effect is pretty strong, but, as far as EVs go, it’s a fairly well sorted product. Of all the vehicles we sampled on this trip, the main attraction was the Stonic crossover. With a size that’s just over 4-metres in length, the Stonic, with its unique styling, two-tone paint and interesting design details, is the product that I think could work the best for Kia in India. The Stonic looks pretty chunky, and the bright colours work well with its design and two-tone style. The cabin is pretty good too, and spacious as well. The high roofline helps massively here. Sure, the full black interior is probably a no-go for India – even though all-black is actually my favourite. But, with its compact size, which fits well with our taxation laws, and ideal engine options – a 1.0-litre turbocharged petrol and a 1.6-diesel – I think the Stonic has a lot of potential in India, especially given how well the Vitara Brezza is doing and the fact that it’s virtually unchallenged in the market. Sure, the Stonic would need to be reworked a bit to meet the sub-4-metre regulation and optimised for local production to be aggressively priced. But, with sales of SUVs are going through the roof quarter-after-quarter, and the fact that the segment is virtually dominated by one product, the Stonic could be a great addition to Kia’s Indian product range in the near future. Of course, we already know that the first product from Kia – part of the Hyundai Motor Group – will be a Creta-sized SUV. Expect it’s launch in the second half of 2019, and then expect a lot of sustained action from Kia thereafter in the Indian market. The three different cars we had the opportunity to drive in Frankfurt - the Kia Stonic (above), the Ceed hatchback (below) and the Soul EV (below the Ceed). The wonderfully integrated side marker lights on the Stinger GT’s rear quarter panel were necessitated by American regulation. We began with a presentation from VP of Design, Gregory Guillaume, who explained the details responsible for the acclaim Kia has received for its designs.